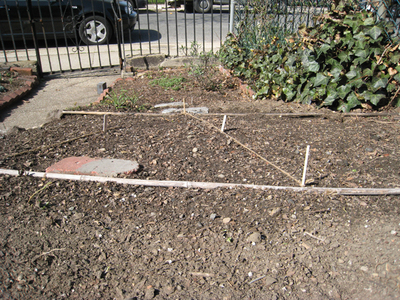 Did anyone notice that the side of my garden reserved for vegetables has been ignored? With this April's crappy weather as my excuse, I'm embarrassingly behind on seed planting. 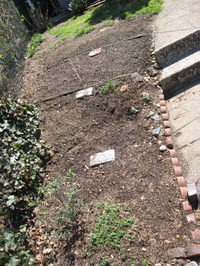 I enlisted Brandon's help today and we got a few things planted. 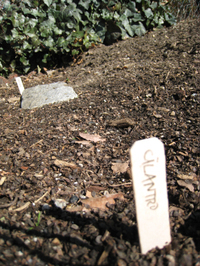 He sowed cilantro, parsley and dill while I scratched in seeds for butterhead lettuce, arugula, and a mesculun mix. I hope it won't get too hot right away since the greens prefer it cool. Also, the starlings and sparrows were a little too interested in that area when we finished, but they've got more time than I do to be out there so I'll just have to hope for the best. 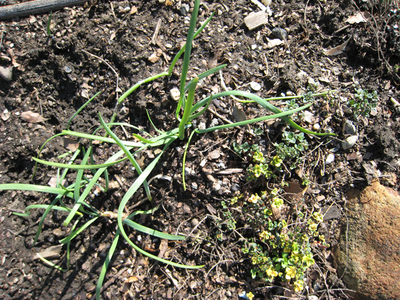 There were a few stray onions sprouting from last year so I moved them all together next to a once-very-large clump of thyme which may or may not be coming back.